14 January 2010: Though only mid-way through his first term, Nagasaki mayor Tomihisa Taue has attracted an international profile as an outspoken opponent of nuclear weapons. A bureaucrat turned city leader, not uncommon in Japan, Taue has surprised many with his energy and informal approach to governing the city, which lies at the south-western edge of the country and has long been its gateway to the world. Born on the Gotó islands off the city’s coast in 1956, Taue was educated at the reputable former imperial Kyushu University, where he studied law. On graduating, he accepted a post in the Nagasaki City government, later becoming involved in public relations and tourism promotion. As manager of the city’s tourism bureau, Taue literally led by example as a volunteer tour guide in the city. During this time he proposed and oversaw the creation of the Nagasaki Saruku Haku in 2006, billed as ‘Japan’s first walking expo’ (‘saruku’ is Nagasaki-ben (dialect) for ‘strolling’), which not only extolled the virtues of psychogeography through “rediscovering” the city but also attracted extra tourist revenue. Taue’s final posting in the city government was as manager of the statistics division, a key responsibility in the Japanese bureaucracy. He was still employed for the Nagasaki city government when the April 2007 municipal election began in the city, but made a sudden entry into the race when the sitting mayor Iccho Ito was assassinated by a crime syndicate member while out campaigning. Following Ito’s death, the election was contested between his son-in-law Makoto Yokoo and late entrant Taue, who filed their independent candidacies just five days before the election. While Taue sought to portray Yokoo’s candidacy as nepotistic and patronising to the electorate, many voters viewed staging the election so close to Ito’s death as insensitive and spoiled their ballots by either writing in the former mayor’s name or protest voting. After a close-run ballot with many recounts, Taue beat Yokoo by a mere 953 votes. Surprisingly city officials refused to cancel the votes of those who had already voted for Ito by post. Ito’s killer was later sentenced to death for the crime, which he admitted his guilt, though the motive remains unclear. Ito was the second Nagasaki mayor to be shot, though the first, Hitoshi Motoshima, survived the attempt on his life in 1990 following remarks he made about the Emperor of Japan’s role in World War II. On account of both shootings, unsurprisingly security around the new mayor is tight, both at home and in the city hall. Since becoming elected as mayor in April 2007, Taue has deployed the knowledge gained from within the city government by formulating a three-pronged approach to local statecraft. Taue speaks of three interconnected spheres of power in the city  “the power of the people”, “the power of the city administration” and “the power of the community”. In order to harness the power of the people, Taue makes himself available to residents on a continual basis  holding informal gatherings with residents (known as ‘champon’ meetings, after the local noodle dish) and with voluntary groups as part of his ‘Rainbow City’ initiative. The power of the city administration is organised in a similar manner  all city officials are invited to join the mayor for lunch once a month and he remains contactable by a dedicated hotline. Finally, the power of the community is realised through emphasising Nagasaki’s unique historical and cultural profile in order to secure more tourism, investment and students to its universities. Particular emphasis is also placed on the protecting the vulnerable by Taue, as well as the elderly and disabled, the city must also put measures in place to assist parents, he argues. Taue outlined this approach in his recent annual statement to the city council in March 2008. Unsurprisingly, given the city’s international profile as the location of the atomic bombing which concluded the Second World War, Taue takes a robust line on nuclear weapons, not only pressing for the better welfare of the ageing victims of the 1945 detonation but for the international disarmament of remaining stockpiles by all nuclear nations. This stance has seen Taue enter into severe disagreement with politicians of all stripes in Japan. Shortly after his election, his criticism of the country’s then defence minister Fumio Kyuma’s suggestion that the atomic bombings “could not be helped” later contributed to his resignation from the cabinet. He then took veteran Liberal Democratic Party heavyweight Taku Yamasaki to task for his belief that North Korean nuclear testing was a ‘good thing’, as it revealed the regime’s weapons capability. Yamasaki responded in saying that he would join Taue in opposing nuclear weapons, as he had always done. During the August 2008 anniversary of the Nagasaki A-bomb, Taue read out a peace declaration in the presence of Japanese Prime Minister Fukuda, urging the abandonment of nuclear weapons, particularly by states seeking to acquire them. Non-proliferation is not just a political aim of Taue, as he has since used the city’s historic association with nuclear weapons for more positive benefit, by lobbying the country’s Olympic Committee to make Nagasaki and Hiroshima the joint candidate for its bid for the 2020 Olympic Games, following Tokyo’s recent unsuccessful bid for the 2016 games (losing to Rio). There are considerable hurdles to overcome, not least that provincial cities generally do not achieve the same bid strength as capitals, but also that under the IOC rules, only one city can bid from any country. Despite some cold water being poured on this innovative attempt, solutions have been offered, such as Nagasaki hosting a number of events under a single Hiroshima bid. A decision is expected in 2011. 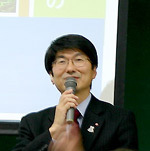 Taue was elected as chairman of the Association of Mayors of Core Cities in May 2007. Japan’s 39 core cities (those above 300,000 residents) enjoy competency in some areas of administration normally reserved for the upper-tier prefectural government (in Nagasaki City’s case, that of Nagasaki-ken (prefecture), though not as many as the 17 designated cities (those above 500,000 population). Nagasaki-shi (city) was approved as core city as part of the second wave in 1997. During the sakoku (closed) period of Japan’s history (1641-1853), Nagasaki was the sole window for the outside world as a conduit for trade, following the construction of a Dutch trading post in the city and the expelling of Portuguese missionaries. The city retains close links with the Scottish city of Aberdeen through the celebration of the life of Thomas Glover (1838-1911), who came to Japan and helped found what would become the Mitsubishi Corporation and the Kirin Brewery, as well as introducing steam locomotives to the industrialising nation. 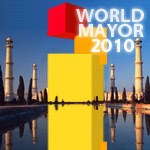 City Mayors, the international think tank on urban affairs, is seeking nominations for the 2010 World Mayor Prize. The Prize, which has been awarded since 2004, honours mayors with the vision, passion and skills to make their cities incredible places to live in, work in and visit. The World Mayor Project aims to show what outstanding mayors can achieve and raise their profiles nationally and internationally. The organisers of the World Mayor Project are looking for city leaders who excel in qualities like: leadership and vision, management abilities and integrity, social and economic awareness, ability to provide security and to protect the environment as well as the will and ability to foster good relations between communities from different cultural, racial and social backgrounds.